The work of Wadsworth and Jae Jarrell exists simultaneously within two spheres, serving as stunning visual objects and as vessels for communicating strong sociopolitical messages. In 1968 the newly wed Jae and Wadsworth founded the collective AfriCOBRA (African Commune of Bad Relevant Artists) with Jeff Donaldson, Barbara J. Jones, and Gerald Williams. Headquartered in Chicago, the group gathered in Wadsworth’s studio, uniting around a specific objective: to develop an approach to art that was separate from the dominant, Eurocentric, and marginalizing standards. 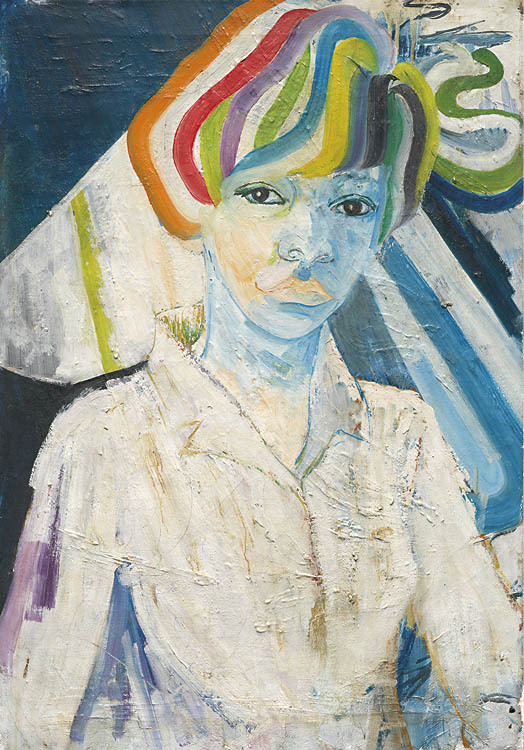 They sought to create work from a distinct perspective, one intrinsically tied to their background as African Americans. In a country during a time when the prevailing sentiment remained largely anti-black, AfriCOBRA told the world about the power, persistence, and beauty of African heritage. That mission is one that the Jarrells stand by to this day. Although the husband and wife of 50 years have lived throughout the United States, they now call Cleveland home (the city is Jae’s birthplace), living and working in the historic Glenville neighborhood only a mile from the Cleveland Museum of Art. 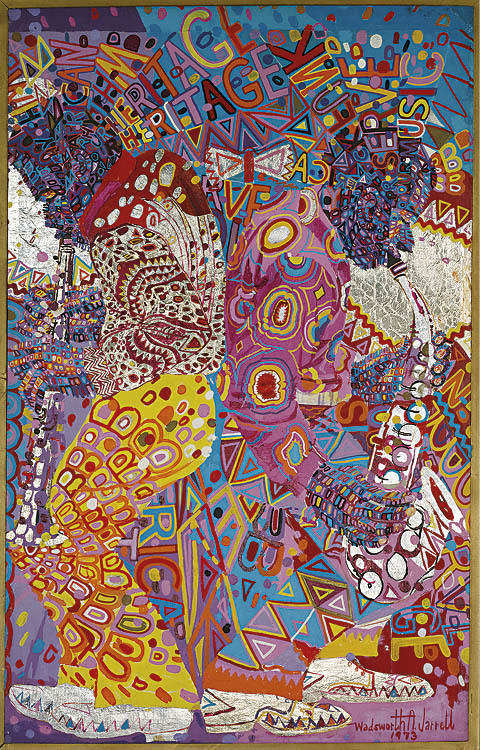 Inspired by the museum’s recent acquisition of Heritage, a seminal painting by Wadsworth, Heritage: Wadsworth and Jae Jarrell features more than a dozen dynamic works by both artists from the mid-1960s to now, a stunning array of colorful paintings, sculptures, and textiles that illustrate the couple’s keen ability to incite change and to deliver a potent message through visual art. But what does heritage look like for African Americans? Jae views African heritage as a “grandparent overseeing young upstarts.” This mentality is evident in both artists’ work throughout their individual careers. During the 1960s and ’70s, when racial tensions ran high, for AfriCOBRA the arts served as a methodical tool for restoration and rejuvenation within black communities. Their work used visual culture like an instrument, playing songs about strong black families, civil rights activists, and African American cultural icons. Their work proclaimed that African Americans would no longer tolerate the demoralizing depictions and racial rejection that clouded the truth of their intellectual and social contributions. In the words of Wadsworth, “African people are the forerunners, innovators, creators” and “the hip.” These concepts resonate in his work, aptly titled Heritage, in the museum’s collection. The dazzling painting implements key elements of AfriCOBRA’s carefully formulated aesthetic: vivid “cool-ade colors,” free symmetry, dynamically lettered messages, and shiny layers of metallic foil. Music is extremely important, not only within the context of African American heritage, but for the artists themselves. Even as Wadsworth began to artistically explore outside the AfriCOBRA guidelines, music genres such as jazz remained a key factor in his work. In fact, the same qualities and influence are seen in the work of both artists. For example, Jae’s passion for textile design is exemplified in Scramble Jacket, a meticulously crafted garment that lists the names of black musicians in the style of a crossword puzzle. 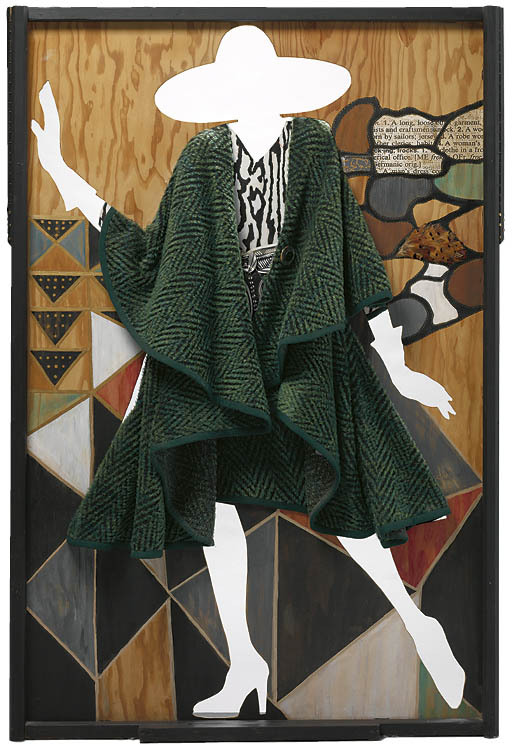 Beautifully intricate, her work melds images, objects, fabric, and form within striking textiles and sculptures that reflect the rhythms she experiences from African art. More recently, she has approached her work from a broader standpoint, extending beyond the human form. By embedding handmade garments within larger sculptural forms, she constructs a new three-dimensional perspective. The Jarrells’ work demonstrates how African American heritage marries the experiences and history of black people in the United States with the influence and essence of their African roots. As Jae states, both of them are “dealing with cultural references, finding our beginnings, appreciating the preservation of our ancestors, and just seeing the beauty in incorporating that in our work.” Today, the couple has expanded beyond the specific parameters of AfriCOBRA, though they will always consider the group as family.